As the name implies, it is primarily a meat bird of extra large frame. A little slower to mature than Rocks, Reds, and other more common heavy breeds, it will eventually surpass them in size and weight. 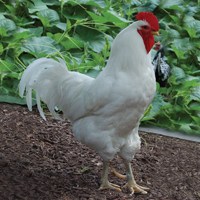 Yellow skin color and white plumage make an easy fowl to dress.